In 1980 I was hired at Staten Island University Hospital during the severe nursing shortage that was occurring here in New York City. Even though I was a new nurse, I was put into the Intensive Care Unit. I had to learn very quickly how to be an ICU nurse. Some of the nurses there made me learn very quickly – in an ICU there isn’t much time for the nurses to be training a brand-new nurse. I had to learn my job very quickly. I soon realized that if I teach the other nurses in the hospital how to do things, I would also learn it. The more I taught the other nurses, the more I understood nursing. I found this very rewarding, and I loved helping them. I had developed a reputation as a preceptor, and never minded the added responsibilities. 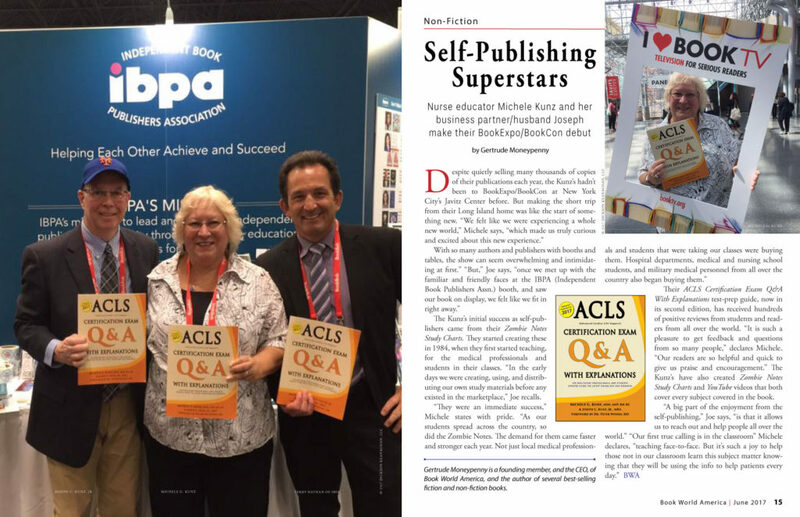 After teaching other nurses for a few years, I became an expert in many nursing topics. I then realized that nurses were coming to me for information and training. It was easy to see that there was also a shortage of nurses that had the ability or desire to effectively teach other nurses. Physicians were often forced to teach the nurses – but they didn’t have the teaching ability, desire, or time to relate to the nurses. I could easily relate to the nurses, so I was popular and the nurses loved me – and I loved what I was teaching about. My passion for nursing and helping other nurses never wore out. In 1984 I moved over to Long Island College Hospital, in Brooklyn, NY. There I became a Staff Development Instructor in the Nursing Education Department. For the first time, my official job was to teach hundreds of nurses. 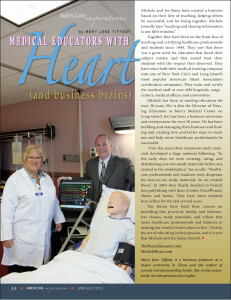 I was also now teaching American Heart Assn. certification classes in ACLS, BLS, and PALS to the entire hospital staff. By 1997 I was the Director of Nursing Education and Research. I would remain there until 2009 – when I moved to Mercy Medical Center, on Long Island, to become their Director of Nursing Education and Research. In 1984 I also met my husband Joseph. He already was an entrepreneur – and was already running his first start-up company on Long Island. We hit it off right away. Joseph has amazing management, marketing, and technology skills that have helped make our company the professional enterprise that it is today. He was quick to realize the potential of the computer and internet to help our business and to help education. In 1985 a nursing friend told me about a part-time job as a nursing educator at a nurse staffing company in Brooklyn. It sounded like a nice way to do more teaching. My husband Joe came with me as an assistant instructor. While there we learned the ins and outs of running and managing an actual training company. After a few years my reputation for training was well-known throughout Brooklyn, Queens, and Nassau (Long Island, New York). We received very good feedback with the learning experiences we gave them. We were also getting requests to come to medical offices and hospital departments to teach the ACLS, BLS, and PALS. We both then decided to set-up our own little company, and have our own training classes. We haven’t stopped teaching since then. At first we were teaching at a few medical offices – but word about us and our classes spread by word-of-mouth very quickly. Soon we were teaching classes throughout Brooklyn, Queens, and Nassau. 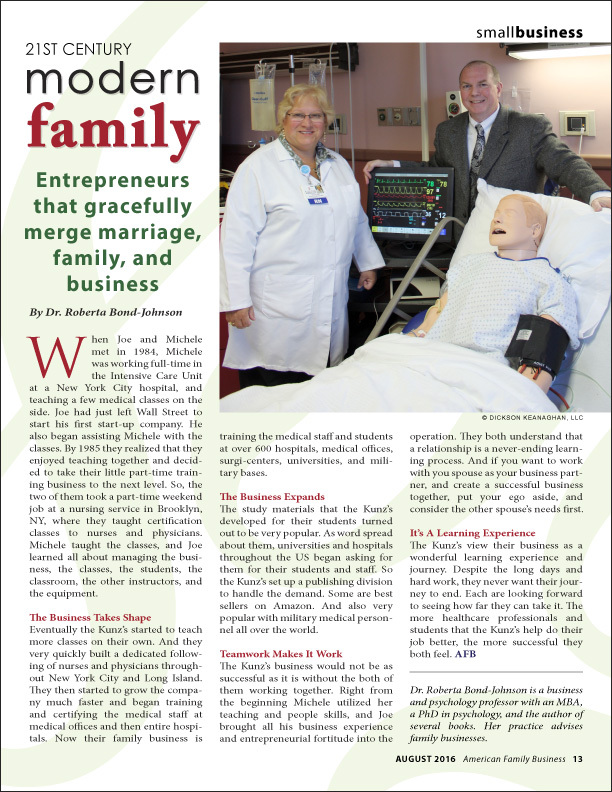 In 2003 we hired a nursing friend that I worked with at SIUH to handle our sales and scheduling. She has been able to develop very extensive contacts throughout the nursing and medical community here in New York City and on Long Island. Because of this she has been able to fill our classes with all types of healthcare professionals. By 2007 we were training the medical staff of over 600 hospitals, medical offices, and surgi-centers on Long Island and New York City – and the study body of several colleges and universities where students are studying to be RNs, PAs, and MDs. Back when we started teaching classes in 1984, we had to develop our own study materials for our students. Not much existed in the marketplace. And what study material did exist wasn’t very popular or user friendly. So we developed study material for each subject that we were teaching. We listened to what our students were saying about the study material, and we fine-tuned it over the years. Word spread about our study guides and we began getting requests from college professors and hospitals for copies of our guides. Soon we were getting request from all over the country. Then health professionals in the American military also began requesting our study guides from bases all over the world. So, in 2003 we finally decided to make our study guides commercially available. We re-designed our study material to make them commercially viable. We set-up our publishing company and began distributing them all over the world. Our little company started as a fun way for us to help nurses, utilize our talents, spend more time with each other, and make a few extra dollars – and ended up turning into our life’s mission – to help medical providers be better, more productive, and happier. I have already been to Michele’s classes three times. The Zombie Notes are the best memorization guide available. Michele is also the best educator around, by far. We ask her to teach our office every time.